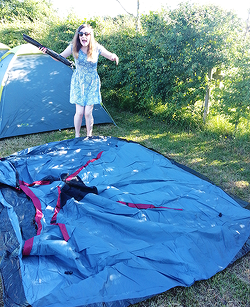 I couldn’t find a nice, flattering picture for this page so here’s me attempting to put up a tent. I know I look silly but, against all odds, that pile of stuff turned into a pretty stable tent. Let that be a metaphor for most of my endeavours. I have an English degree, a Best Improved Runner 2014 trophy and a group text devoted to a TV show about zombies. On this here blog, I write the experiences of a 20-something (me) attempting to navigate the world, often with a pair of trainers on my feet. I run for Wimborne AC and sometimes buses. You can contact me on Twitter @jessevekennedy or via my contact page.